currently in preconstruction at 3112 7th Street Northeast, Washington. Sales for available units start from the high $700,000's. Portrait Square at Brookland has a total of 22 units. Sizes range from 1600 to 2600 square feet. An intimate community of luxury townhomes, Portrait Square achieves an ideal balance for those desiring peaceful, tree-lined streets and a close proximity to shops, restaurants and the Metro. Portrait Square is just a few blocks from Monroe Street Market, filled with local favorites like: Busboys & Poets, Brookland Pint and The Bike Rack, as well as the Arts Walk with its eclectic mix of artist studios and shops. The neighborhood is also bustling with a full schedule of outdoor events, including farmers markets, art strolls and garden tours. Located near the corner of 7th and Jackson Streets, NE, Portrait Square allows for a variety of transportation options. 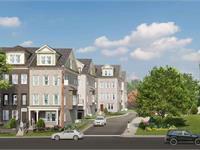 Each townhome includes a garage, and the community is walkable to the Brookland-CUA Metro Station and Capital Bikeshare stands. Your inquiry will be delivered to the Portrait Square at Brookland sales team, who will send you more information about this development.